J. Mane Gallery is pleased to present its Monochrome International Online Juried Art Exhibition for the month of March 2019. Monochrome means one color, so in relation to art, a monochrome artwork is one that includes only one color. Throughout the centuries artists used different shades of brown or black to create monochrome pictures on paper. The medium they would use would simply be more or less diluted to achieve the required shades. The play of light and dark enabled the artist to define form and create a picture. For this competition, artists were encouraged to share their artistic vision and interpretation of any subject. The artwork varied from realism to surrealism to abstraction. All artists over the age of 18, regardless of location or experience, were encouraged to submit their best inspired work. Each of our monthly themed exhibitions, awards for First, Second and Third Place. The First Place winner for the Monochrome show is Tara Merkt for her scratchboard, Carapace Cadence. Tara’s excellent command of the medium is what set her work apart. Tara is also the Featured Artist for the month of March. 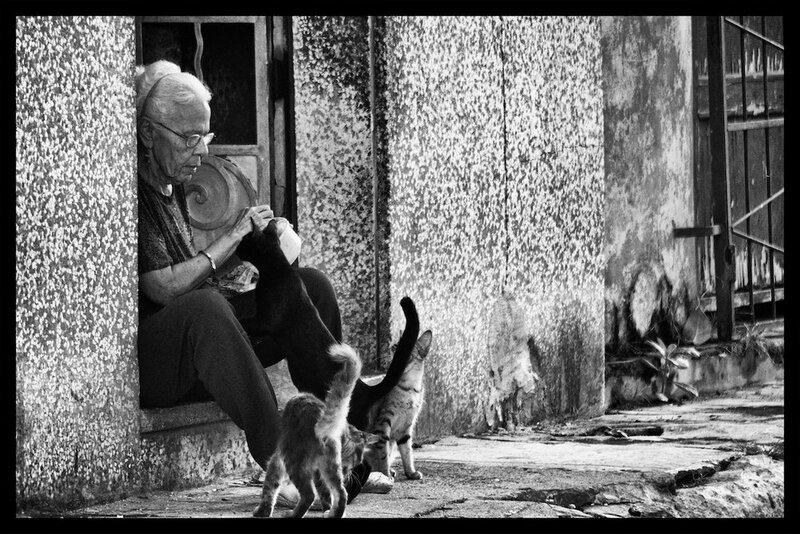 Taking Second Place is Sandie Lee Butler for her photograph, Cuban Cat Lady. And, Third Place goes to Leah Oats for her c-print, Transitory Space-Nova Scotia, Canada Blue Tree 106. Ten Honorable Mention awards were given as well. Honorable Mention awards go to Kelly M. Coffey for her digital photo, Sunramp, Cyrille Dubreuil for his photograph, Milan Borderland 9, Michael Duke for his photo, The Stairway, Derek Entwistle for his photograph, Izzy Kapetanovic for his photograph Mostly Frozen Lake, Jon Krawczuk for his watercolor, Union 3, Gaylord Mink for his photograph, Man With Flute, Amy Raudenbush for her watercolor, Philly Busker, Kristopher Schoenleber for his photograph, Escher, and Jos Stumpe for his acrylic on canvas, Reflection In The Dark. Please visit the Monthly Winners Page to learn more about each of these award winning artists and to contact them directly about their work. If you are interested in purchasing any of the artwork in this exhibition, please contact the artists directly. J. Mane Gallery does not enter into the selling of artwork featured in any of the monthly online exhibitions. You will find the artist's website or email by clicking on their images below.